Sorry - we are no longer accepting order for these dinners. This year we will be offering our ready-to-eat Valentine Dinner for Two on Saturday, February 16th. They'll be available for pick-up from 3 pm until 5 pm on Saturday 2/16 only. You may choose to pick your meals up hot or cold. They should be served or refrigerated within two hours of pick-up. ​With our Valentine Dinner for Two, each of you has your choice of entree. Our Imperial Stuffed North Atlantic Flounder features our special recipe crab stuffing and is topped with a baby shrimp scampi sauce. Heating Instructions: These dinners are fully prepared and ready to eat. If necessary reheat in a 325 degree oven for 12-15 minutes. In a pinch you may instead microwave on high for 2 minutes. 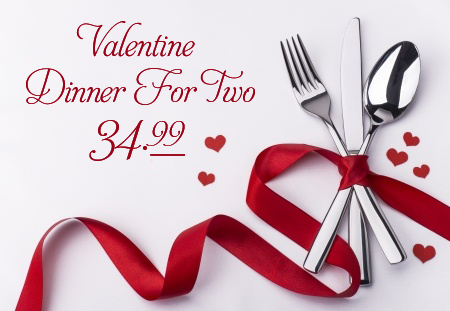 Ordering more than one Valentine Dinner for Two? Please submit a separate form for each, or call (856) 767-0110 to order.